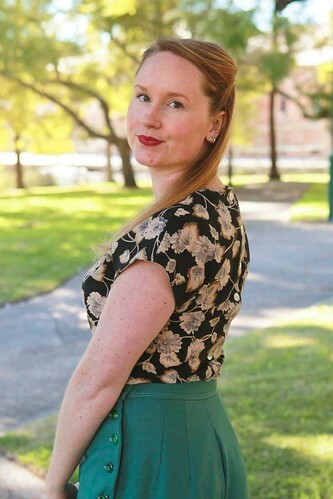 I was lucky enough to be asked to test another Blue Ginger Doll pattern a few months back and now that it's been released, I can finally show you my version of Abbey's newest pattern, the Mae Blouse. 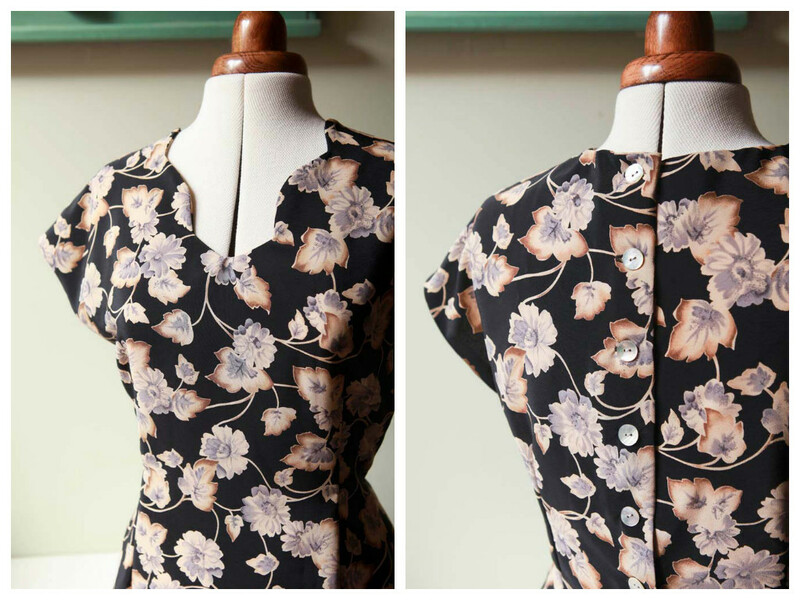 It's a beautiful 1940s inspired blouse with a scalloped neckline (who doesn't love a good scallop, of the edible and patterned variety! ), a button up back and a lovely fitted silhouette. I made my Mae using a vintage mystery fabric that I'm pretty sure is a silk georgette with some beautiful vintage shell buttons. 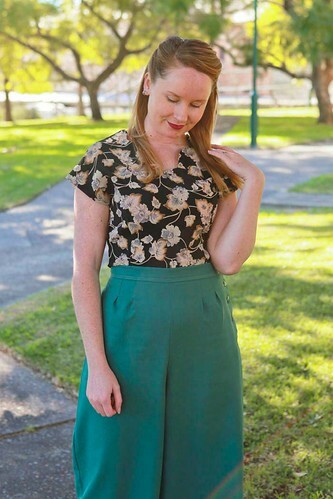 I actually had this combination saved for another 40s button up blouse that I hadn't quite gotten around to making yet, but as soon as I saw Mae, I knew they would be the perfect match for each other. Abbey recommends using a stiffer fabric for the blouse to support the scallops, but so that I could use my lovely fabric, I used interfacing on both the blouse scallop and the scallop facing to give it the structure it needed, and it seems to work really well. 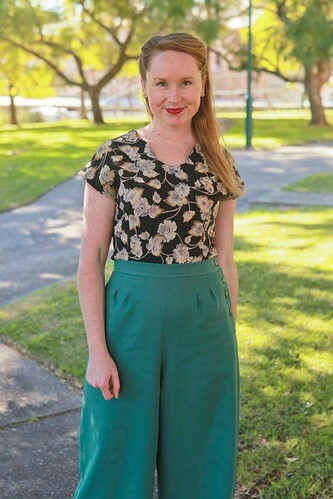 I'm wearing my Mae tucked into my 1940s Swing Pants, but Abbey has designed the pattern so that you can make it longer and wear it over the top of a pencil skirt (very 40s!) 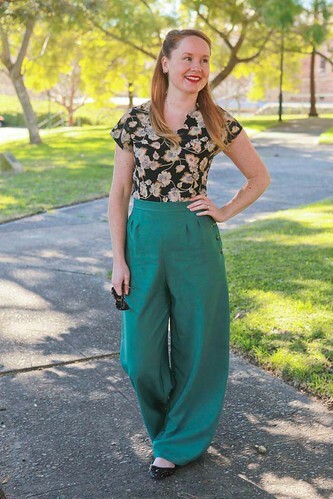 or with jeans for a more modern look. This pattern is such a quick and satisfying make - I made mine in less than a day all up. It's also the perfect pattern for a beginner looking to start adding new techniques to their repertoire like button holes and scalloped edges. 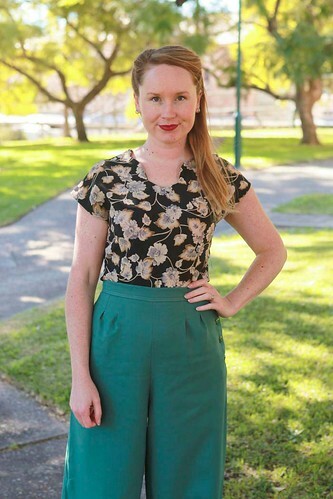 Right now Abbey has 10% off the Mae Blouse pattern using the code LOVELYMAE2013 and she has free world wide shipping! So there are no excuses not to add this beautiful pattern to your stash. And while you're at it, you may as well get the Billie Jean dress pattern too, I wear mine all the time! 25 comments on "The Darling Buds of Mae..."
Oooh, it's just lovely Jen! And it works a treat with your beautiful trousers too! I absolutely adore this top. Great job! That top is just lovely. The scallops frame your face very nicely and the fabric is just darling. Very nice work! That is BEAUTIFUL. I will have to check out that pattern! So pretty! Love the shape, and the buttons. Beautiful fabric too. Very sweet blouse and you are right, there is something about scallops of any sort! Gorgeous trou ..... Gorgeous fit as always. Oh I do love a button back blouse! This is gorgeous. I love the neckline. Such an interesting shape. That blouse looks wonderful on you. Those colors really contrast with your skin. And thank you for telling us about this pattern. 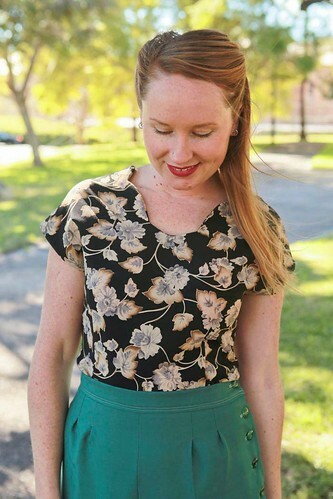 I'm lately on the hunt of blouse patterns to renovate my wardrobe. This is going into the list. I'm so in love with this outfit!! I've never heard of this pattern company before. I will definitely add to my list. 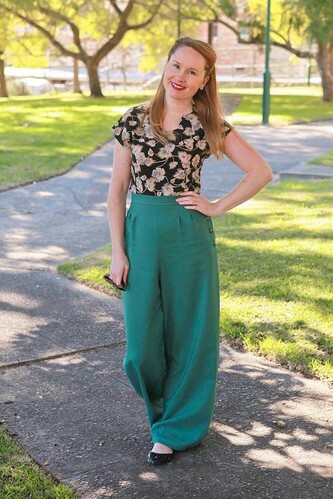 Summertime vintage style outfit perfection. Oh...my...word, do I adore your classic, gorgeous look here, honey. *PS* Thank you very much for your your blog comment. 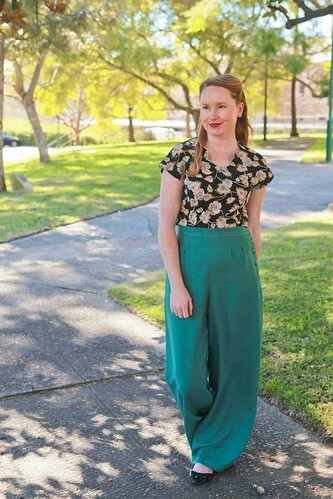 I'm astronomically shy (and introverted - a topic that I'm actually planning to write in depth about later this year) myself and can completely relate to feeling uncomfortable with the gazes that wearing vintage can sometimes elicit. For nearly all of my life, I actually had a genuinely hard time making eye contact with most people I passed in public (no matter if I was wearing vintage or not) because of my shyness, but I've been working on this big time in the past year and a half, and have improved somewhat (hopefully more so as time goes on). This is beautiful!! I hopped right over and ordered a copy of the pattern for myself! VERY cute blouse! 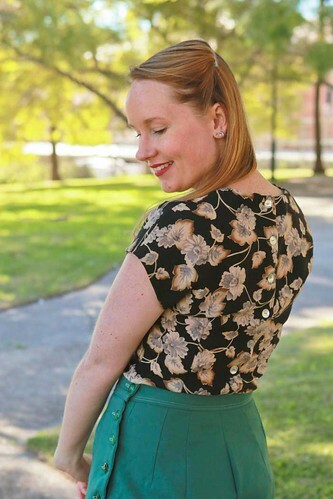 I love the neckline detail, and I'm a sucker for a button-back blouse. :-D I think this pattern is going to be a huge success, that is, if your version is any indication. I agree that blouses are nearly always better in a drapier fabric. 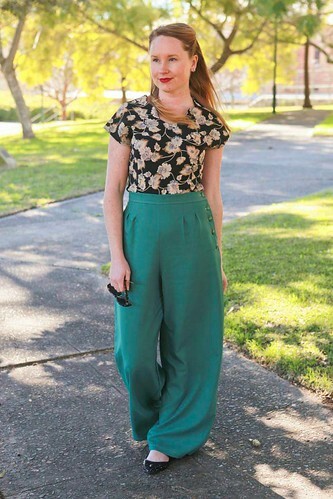 I love the fabric you've used and the blouse looks lovely with your trousers! This looks so sweet on you! It really fits your style! Very nice blouse!! Always great to see what pattern designers have been up to, and see their patterns sewn up in the 'real world'. :) I think the fabric you chose is lovely, that's great that the interfacing gave it enough structure to hold the scalloped neckline. It's gorgeous I love the cut at the top it's really different. Beautiful! I'm glad you went with this fabric even if it was "too soft" cause it looks perfect sewn up as this pattern. I've ordered mine but will have to wait patiently for it to arrive. I can't believe your departure is so soon! Eeek! I don't suppose you even have time for a catch up before you go? Such a great blouse and I adore your whole outfit.